While Dr. Kouadjo Hilaire said one final goodbye to southern California’s warm shores and the friends he made during his Fulbright experience, his beautiful home country, Côte d'Ivoire, was about to enter a tense election stand-off, which would precipitate violence in the coming months. Throughout this period of Côte d'Ivoire’s history, Dr. Kouadjo’s courage will be remembered as nothing short of remarkable. Not long after Dr. Kouadjo returned home, in October 2010, the results of the presidential election were revealed: former President Laurent Gbagbo came in first, but it was not enough to win the election outright. Former premier Alassane Ouattara was second, and a run-off vote was held the following month. The election was held in accordance with the 2007 Ouagadougou Political Agreement, a peace agreement designed to unify Côte d'Ivoire after the civil war in 2002. In December 2010, Mr. Ouattara won the run-off, a result certified by Côte d'Ivoire’s Independent Electoral Commission (IEC). The former president, Mr. Gbagbo, did not accept the results and the ensuing dispute between the two political camps descended into grave conflict, resulting in human rights abuses, deaths, and attacks on U.N. peacekeepers. Using the skills he gained during his Fulbright exchange, Kouadjo volunteered with the UN Mission in his country and hosted conferences with community-based thought leaders to promote reconciliation between opposing factions, coaching them on techniques to help foster a peaceful coexistence. In November 2011, with the concurrence of the Ministry of Culture, Dr. Kouadjo was appointed as the national supervisor of conferences and panels for Côte d'Ivoire’s national reconciliation campaign. In this role, he brought hundreds of village chiefs together. Many had not spoken in more than a decade. 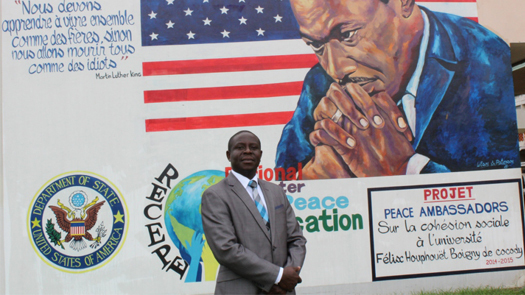 Dr. Kouadjo Hilaire stands in front of one of the murals his students created featuring famous peacemakers. Knowing that the seeds of peace must be planted in every generation, Dr. Kouadjo turned his attention to helping the next generation and entered the very first U.S. Department of State’s Alumni Engagement Innovation Fund (AEIF) grant competition. Dr. Kouadjo was awarded an AEIF grant to start a “Peace Ambassadors” program for youth. From 2011 to 2014, he implemented the program to mitigate violence in conflict-prone high schools in Abidjan. From October 2014 to July 2015, he managed a similar program at Houphouet-Boigny University. The program, which was funded by the U.S. Department of State, was geared toward promoting social cohesion and peace building on campus. Three thousand students from rival associations at the university formed peace clubs with the purpose of working collaboratively and cooperatively around common projects through capacity building, sports, and personal development activities. Today, though Côte d'Ivoire continues to face reconciliation challenges, his peacebuilding associations continue to flourish. His students’ murals, conveying messages of peace with the likenesses of notable peacemakers (Martin Luther King, Nelson Mandela, Rigoberta Menshu, and Mother Theresa), stand as testament to his efforts and their willingness to move their country forward in a peaceful direction. While managing vital peace and resolution initiatives, Dr. Kouadjo never lost sight of his exchange alumni family and he made time to promote exchange programs in his community. As the president of the Côte d’Ivoire Fulbright Alumni Association in 2013, he ensured that the association trained students in research and issued newsletters to encourage people to consider applying for a Fulbright scholarship. In 2014, he organized a national Fulbright Day that gathered many Fulbright alumni and potential candidates. He also managed the English Access Microscholarship Program class, which is funded by the U.S. Department of State, for high school students with few other means to learn English. Alumni of the program were able to attend well-respected schools after receiving their high school diplomas. In an effort to expand the opportunity, Kouadjo developed the National English Access Microscholarship Association, providing a national platform for the program. As a Fulbright alumnus, Dr. Kouadjo has expanded the exchange community by promoting opportunities and managing an English Access Microscholarship Program class; as a peacemaker, he has helped heal his country; and, as a global citizen, he continues to stand as a shining example of what can be achieved through courage and understanding.